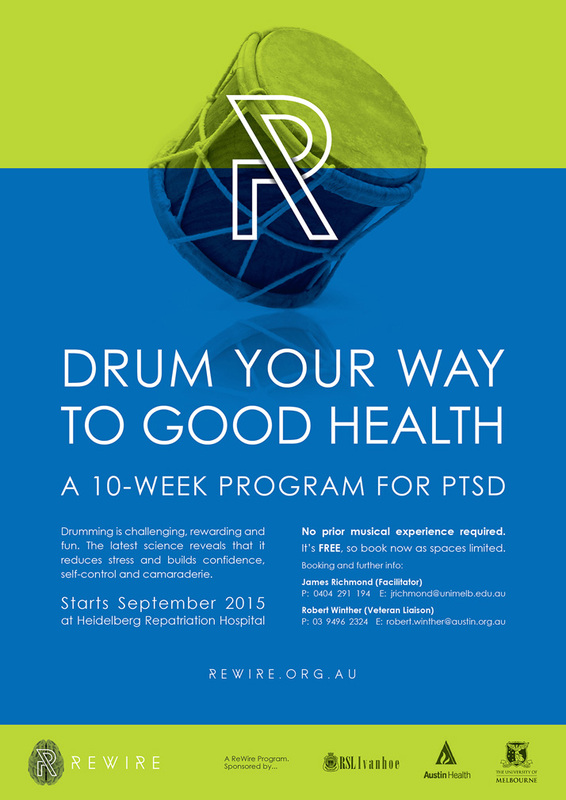 Rewire has recently partnered with Ivanhoe RSL, Austin Health and the University of Melbourne to conduct ground-breaking research into the effects of group drumming on the social and psychological functioning of people with a history of Posttraumatic Stress Disorder. This research will further our understanding of the effects of music participation, and contribute to improving services, activities and support for people with a history of PTSD, in particular, veterans and emergency service workers. We are seeking adult volunteers with a history of PTSD. No prior musical experience is necessary. The Rewire Rhythm program is collaborative, challenging and enjoyable. Participants drum together with a facilitator and occasional guest musicians, for eight weekly 90 min sessions, culminating in a public performance and/or the recording of their own CD. No prior musical experience is necessary and loan instruments are provided. Distinct from traditional music therapy, this innovative program brings clinical psychology and neuroscience together with community music. Harnessing the power of music to rewire the brain. Using rhythm as a powerful way to connect people with each other, and with their own internal rhythms. Drumming up empowerment and reconnection. Rewire Rhythm aims to equip participants with the resources to continue running their own drumming group after the initial 8-week program. As other groups complete the program, participants can access more opportunities for collaboration and group performances, providing ongoing creative outlet and building a community of empowered, resilient drummers. The program is free* and will be delivered by James Richmond, BA(mus), BSc (Psych) Hons, MPsych (Clinical Psychology), a provisional psychologist, trained percussionist and experienced music educator. James is currently pursuing a PhD at the University of Melbourne, and the evaluation of the Rewire Rhythm Program is a key component of the research for his doctoral thesis.